Since 2007, Södersjukhuset in Stockholm has been using Ergonomic Lighting from Chromaviso. The first room was a gynaecological operating room, and since then, more rooms with different specialities have been added, such as gastric surgery, orthopaedics and ERCP. The focus is on improved working environment and work quality. 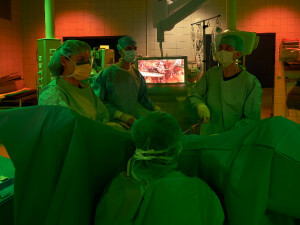 When the patient comes into an operating room at Södersjukhuset, the staff turns on the warm white light. It is designed to create a good and calm atmosphere for the patient, who might be nervous before the operation. ”When we are ready to start the operation, we choose the light that is suitable for the procedure we are starting. If it is x-ray, we choose red light behind the monitor and green light in the room. If it is endoscopy, we choose the reverse option with green light behind the monitor”, explains nurse anaesthetist Ellenor Söderlund. In the operating rooms, the staff has a total of nine settings to choose between for before, during and after the procedure. The light settings for during operation consist of coloured light in different zones – specially designed for the specific procedure, the working procedures of the room and the location of the monitors. The zoned light means that it is possible to choose between white or coloured zone for specific tasks – and this ensures that all professions have the right light at the same time. The red light brings out the grey tones in an x-ray, while the green light reduces glare and reflection. We see very well with the green and red light. 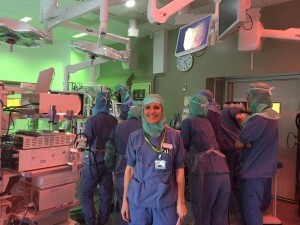 The image on the monitor is better for the surgeon and we have a good work light, which is also suitable for writing notes. We are very happy to work in Ergonomic Lighting. Surgical nurse Kajsa Majlund often stands for 8 hours a day in an operating room together with the doctor and other staff. Therefore, the lighting is of great significance. ”Before we had Ergonomic Lighting, we worked in darkness. It was difficult to see the instruments. Now, we have light as well as a better image on the monitor with clearer contrasts. We are very satisfied”, says Kajsa Majlund. Our eyes become less tired – I feel less strained. It is a great improvement for us and our working environment has become much better. We are particularly happy with the combination of the red and green light at the same time. The lighting concept is characterised by featuring the effective combination of red and green light, which has a user documented positive effect on working environment as well as quality and safety. ”Our eyes become less tired – I feel less strained. It is a great improvement for us and our working environment has become much better. We are particularly happy with the combination of the red and green light at the same time”, explains Ellenor Söderlund. When the operation is over, the light can easily be switched to bright white light, as cleaning is carried out, followed by preparation for the next operation. ”The bright white light is very good and provides us with energy. We have to remember to use it in winter, where we need light”, says Ellenor Söderlund. When Ergonomic Lighting was installed at Södersjukhuset, Chromaviso gave the technical as well as the clinical staff instructions on how to use the light as well as information about the significance of the light for the work and well-being of the staff.